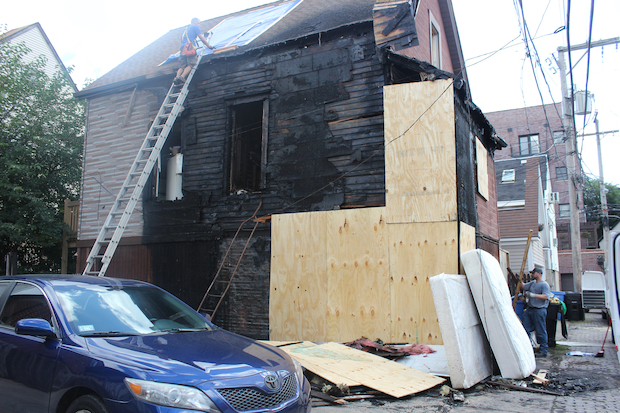 LAKEVIEW — A series of suspicious fires, two of which classified as arson, occurred within a few block radius of each other between 4:30 a.m. and 5:10 a.m. Sunday, according to police. The earliest fire happened in the 800 block of West Roscoe Street around 4:28 a.m., according to Officer Jose Estrada, a police spokesman. The suspicious fires were first reported by the blog Crime in Wrigleyville + Boystown. Someone set fire to a mattress near a garbage can in an alley, Estrada said. The Chicago Fire Department put out the fire upon arrival, and there was no reported damaged to any buildings or vehicles. No one was injured, and the Arson Unit is investigating, he said. Just 15 minutes later, police responded to a call of a coach house engulfed in flames in the 1000 block of West Wellington Avenue, Estrada said. The fire started in a garbage can in the alley and spread to the coach house, police said. There are no reported injuries, and police have not been able to determine if there was any foul play or criminal intent, he said. As of Sunday afternoon, the case is classified as non-criminal, not arson, Estrada said. But the investigation is ongoing, he added. The police activity woke up Pamela Balick, who lives on the block with her husband Philip. Philip Balick heard sirens while he was half asleep and looked out the window. "It was lit up like a Christmas Macy's parade with revolving blue and red lights," he said said. Jesse Gram, 55, who lives in an apartment almost directly across from the coach house, said he saw the aftermath of the coach house fire. But he said it seemed like no one was home, as he saw firefighters pounding on the door to no avail. A worker on the scene said the residents were currently in Wisconsin. Gram has lived in the same apartment for four years, and he said he hasn't seen anything like it before. Workers were cutting holes into the roof, and Gram said he thought the home was burned beyond repair. "Years ago, I saw a fire on an overstuffed chair," Gram said. "It was spectacular, but nothing like this. Just imagine losing everything you've got." The last incident occurred around 5:09 a.m. in the 3200 block of North Kenmore Avenue, Estrada said. Police responded to a call of a fire in an alley near a residence, he said. The fire started in garbage cans and wooden crates, and spread to a white pick-up truck. No one was injured, police said, but the car appears to be charred beyond repair. The Arson Unit is investigating, Estrada said. Nick Wood, 26, who lives in an apartment across the alley said the incidents don't make him particularly nervous. "I'll check my insurance maybe," said Wood, who moved to Lakeview three months ago. "In general, this is a safe neighborhood," said Wood, adding that he had seen the truck come and go since he moved in. Similarly, Neal Cullitan, 26, who lives at Fletcher Avenue and Racine Avenue, isn't worried by the incidents. "I just think crime happens everywhere, and you can't control it," Cullitan said. In June, someone set eight cars and a canopy on fire in Wrigleyville.